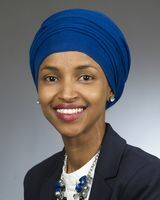 She is the first Somali-American, Muslim woman in the nation to hold a state legislative office (2016 Campaign Website). She was born in Somalia and lived with family friends and then in a refugee camp in Kenya before immigrating to the U.S. when she was 12 years old (City Pages, 10/26/2016). She ran for the 5th Congressional District in the 2018 election after Keith Ellison withdrew from that race to run for Attorney General in Minnesota. Religion provided by her 2016 campaign website.